It is a common failing for writers of non-fiction to assume their readers already know some of the background of their works. The fact that a very large number of Riverview residents have spent less than twenty years (and a number less than ten) in the town, makes it obligatory that such an introduction be included. If this history were an academic study, in chronological order, etc., such a background would comprise the opening chapters; however, it is not and space requirements dictate only a bare outline of the development of this region along the south bank of the Petitcodiac River. Those readers desiring further information should consult the Bibliography and the Town Library with its Archives. 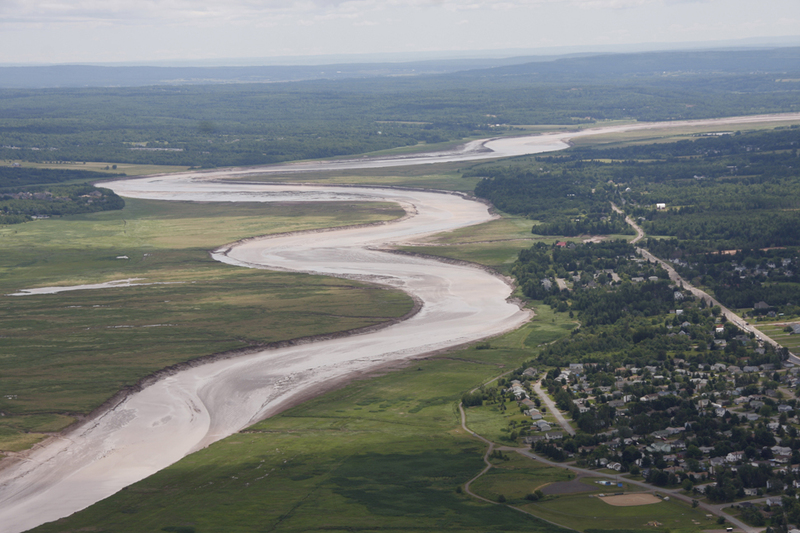 The Petitcodiac River Valley is approximately 350 million years old, dating from the Upper Devonian Age. A piece of petrified wood was discovered in 1972 by a construction company quarrying near the Pine Glen Road. The river was part of the transportation system used by the Micmac Indians in travelling from Nova Scotia to the St. Lawrence River. Mr. Paul Surette in Le Grand Petcoudiac (1984) relates that no less than three settlements were located within or near the town limits. Village de Lacouline was located near the marsh below the Wilmot Cemetery in Lower Coverdale, Three or four families lived in the area known as point Park today. The largest was la Riviere au Crapauds (River of the Toads), but we know it in English as Turtle Creek, possibly an error in translation. The Scott Expedition in November 1758 (during the Seven Years' War, 1756-1763) dispersed the Acadians from the area and the lands on both banks were to remain vacant until successive wave of immigrants from Philadelphia, Yorkshire, and later the former Thirteen Colonies and the British Isles, settled along this river and its branches. In 1845 the parishes west and south of the Petitcodiac were set off from Westmorland and the new County [Albert County], was named for Albert, the Prince Consort of Queen Victoria. In 1765, the Nova Scotia Council had created three Townships, Hopewell, Hillsborough, and Monckton (on the north bank). The extent of these Townships, each of 100,000 acres, is shown on the map drawn by Miss Helen Beals, which is the frontispiece of The Petitcodiac (1945) by Esther Clark Wright. In 1784 the Province of New Brunswick was created and by 1786 counties and parishes were established. In 1828 the northern portion of Hillsborough Parish was set off and called the Parish of Coverdale after the river which flows through the western portion of the parish. A number of Yorkshire families lived along this river, such as the Colpitts, Geldarts and Parkins. The settlers from Yorkshire and Durham arrived between 1772-1775 and were devout Methodists; in fact, their immigration to the Chignecto Isthmas area led to the erection in 1788 of a Methodist Church at Point de Bute, the first in what is now Canada. It is not difficult, therefore, to understand why this river was named for Myles Coverdale (1488-1568) the famous translator of the Bible. The name Coverdale appeared in several small settlements; Upper Coverdale, 9 miles above the bridge at Moncton, Coverdale 6 miles; Middle Coverdale 3 miles or Riverview today, and Lower Coverdale 5 miles below the bridge or just beyond Bridgedale. The 1851 Census reported that the new county had a population of 6,313 of which Coverdale Parish accounted for 902; 430 females and 472 males, of whom all but 21 were classified as "whites." When County Councils were organized in 1877, Coverdale Parish elected two Councillors. These Councils were destined to end on December 31, 1966, being replaced by a number of centres which were then incorporated as villages. The villages which made up the Town of Riverview were incorporated at this time and copies of their certificates of such incorporation are reproduced in the Appendices of this book. The completion of the Intercolonial Railway (ICR) with Moncton as its headquarters in 1876, caused new industries to come into being, river traffic increased and an era of prosperity appeared to be at hand.